The Netherlands’ centre-right Prime Minister Mark Rutte was on course for a resounding victory over anti-Islam and anti-EU Geert Wilders in an election on Wednesday, offering huge relief to other EU governments facing a wave of nationalism. Rutte received congratulatory messages from European leaders and spoke with some by telephone. 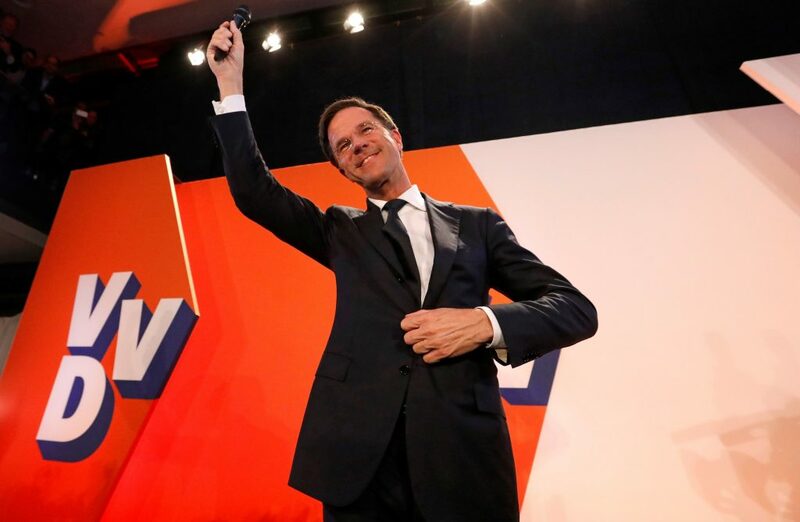 “It is also an evening in which the Netherlands, after Brexit, after the American elections, said ‘stop’ to the wrong kind of populism,” he said. Wilders said he had not achieved the electoral victory he had hoped for and was ready to offer tough opposition. “I would rather have been the largest party…. but we are not a party that has lost. We gained seats. That’s a result to be proud of,” Wilder told journalists. With 55 percent of votes counted, Rutte’s VVD Party was projected to win 32 of parliament’s 150 seats, down from 41 at the last vote in 2012. Wilders was in a three-way tie for second on 19 seats with the Christian Democrat CDA and centrist Democrats 66, data provided by the ANP news agency showed. At 81 percent, turnout was the highest in 30 years in an election that was a test of whether the Dutch wanted to end decades of liberalism and choose a nationalist, anti-immigrant path by voting for Wilders and his promise to “de-Islamicise” the Netherlands and quit the European Union. The result was a relief to mainstream parties across Europe, particularly in France and Germany, where right-wing nationalists hope to make a big impact in elections this year, potentially posing an existential threat to the EU. Far-right candidate Marine Le Pen is set to make France’s presidential election run-off in May, while eurosceptic, anti-immigrant Alternative for Germany is likely to enter the German federal parliament for the first time in a September election. The exit polls helped the euro rise to its highest against the dollar since Feb. 7. But Mabel Berezin, professor of sociology at Cornell University in the United States, said defeat for Wilders, who has been in parliament for nearly two decades, should not be considered a sign that European populism is waning. “He does not represent a populist wave. Rather, he is part of the political landscape and how his party fares does not tell us much about European populism,” she said. Rutte got a last-minute boost from a diplomatic row with Turkey, which allowed him to take a tough line on a majority Muslim country during an election campaign in which immigration and integration have been key issues. The spat did not hurt the chances of Denk, a party supported by Dutch Turks, which looked set to win three seats, becoming the first ever ethnic minority party in parliament, in a possible sign of deepening ethnic division. But, while Rutte averted what in the early stages of the campaign looked like a possible victory for Wilders, years of austerity pushed down his share of the vote. His junior partner in the outgoing coalition, Labour, suffered its worst ever result, winning just nine seats, down from 38 last time. That means it will likely take months for Rutte to negotiate a ruling coalition, with at least three other parties needed to reach a majority in parliament. The result is well down from his 2010 high of 24 seats while support for the two most pro-EU parties, the progressive D66 and GreenLeft, was way up.